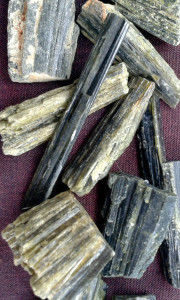 History/Mythology: There are no know healing traditions about Epidote as it was only identified as a separate mineral in the Nineteenth century by French crystallographer Rene-Just Hauy. Epidote is an enhancing stone and will raise the energy of anything it comes in contact with it does this by helping to release any negative energy we are holding and helps raise our vibrations. This is particularly helpful during times of depression or when we are stuck in negative thinking patterns. This helps to increase your personal power by clearing any blockages you have in your body or aura. It also increases your memory and can help you find lost objects. Epidote with increase your perception or and relationship with higher vibrational beings and higher self, therefore facilitating spritual growth and personal power. Epidote helps us to feel more grounded and become more attune with nature and the simpler things in life. Healing – Helps to clear any congestion or energy blocks, dissipate tumors, increase energy leaves, helps to assimilate nutrient better, aids the immune system and healing process particularly when recovering physically from an illness. Can be worn for a long periods of time in direct contact with the body.